Parks & Trails Council entered the 2015 session with a set of ambitious goals as outlined in our legislative agenda. Those priorities, and how they played out during session, are detailed below. The natural resources finance bill that was finalized today provides a major boost to state parks and trails. The budget increases general fund spending on state parks and trails from $39.6 million to $48.6 million – a 23% increase – and includes an additional $740,000 in one-time general fund spending for a trail bridge in Virginia, MN; an OHV trail bridge in Blackduck, MN; and a master plan for a proposed state trail between Red Wing and Lake City. 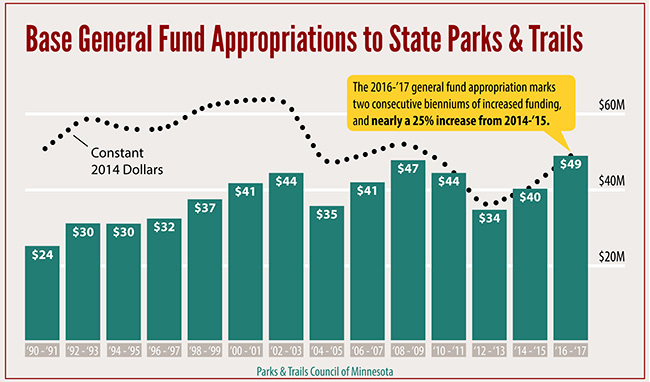 The funding boost for FY 2016-17 restores general fund spending on state parks and trails to pre-Legacy levels and marks the second consecutive budget that state parks and trails received a double-digit percentage increase. While the budget does not cover all the needs identified in our legislative agenda, it is certainly another big step towards funding our state parks and trails at the level they deserve. The Legacy bill was passed during the special session and ensures that a portion of the three-eights of 1 percent Legacy Amendment sales tax will continue to support parks and trails across Minnesota. Parks & Trails Council is thankful that the legislature abided by the consensus recommendation to allocate the Legacy Parks and Trails Fund 40%-40%-20% across Minnesota’s three major park and trail systems. The legislature also agreed to fund the Greater Minnesota Regional Parks and Trails Commission, which is fulfilling the important role of planning across Greater Minnesota’s emerging regional park and trail system. > Reinvest in Minnesota’s park and trail’s aging infrastructure. After failing to pass a bonding bill during the regular session, lawmakers agreed to and passed a $180 million bonding package as part of the compromise leading up to the special session. Unfortunately, no park or trail projects were funded in the $180 million bonding bill, which instead focused on higher education, flood relief, capitol restoration, pipelines, and highways. Bonding for parks and trails will be a major priority for Parks & Trails Council in 2016. > Continue building Minnesota’s parks and trails through the Environmental & Natural Resources Trust Fund. The Environmental and Natural Resources Trust Fund receives a portion of revenues from the Minnesota State Lottery to fund projects that enhance Minnesota’s “air, water, land, fish, wildlife, and other natural resources.” For FY 2016, lawmakers agreed to spend $46 million from the trust fund on important projects for Minnesotans. Included in this amount is $4.1 million for park and trail projects, detailed below. ​State lawmakers are far more accustomed to receiving criticisms and complaints than they are compliments and thanks. Many legislators this session were forced to make difficult votes on bills that would avoid a government shutdown but contained policy they disagreed with. Now that the special session is over, it is a good time to reach out to your legislators and thank them for supporting Minnesota’s parks and trails. But most importantly, we want to thank each and every one of YOU! Whether by attending our Day on the Hill; or contacting your representatives; or writing your local paper; or simply by talking with your friends, family, and neighbors about Minnesota’s wonderful parks and trails, you’ve all made a difference this legislative session. Future generations of Minnesotans thank you!